"The time for compromise has now passed. The South is determined to maintain her position, and make all who oppose her smell Southern power and feel Southern steel." Jefferson Davis. "Talk! Talk! Talk! That will never free the slaves. What is needed is action, action!" Abolitionist John Brown. "There is Jackson standing like a stone wall! Let us determine to die here, and we will conquer." Confederate General Barnard E. Bee. More than 700 provocative declarations in this fascinating book constitute a running narrative by many who lived through or died in the Civil War. The voices of the great and famous, the ordinary and unknown, resound in these pages that bear historic witness to key events before, during, and after the war. 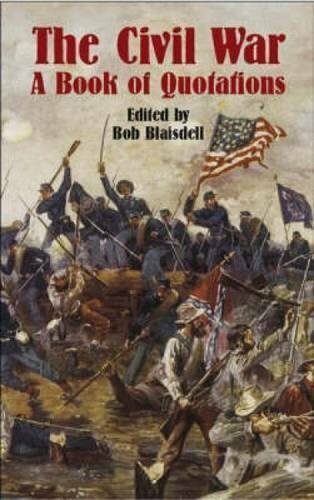 Arranged chronologically and divided into sections on specific topics and events, this well-researched volume puts a human face on history and provides a unique perspective on the Civil War and its times. Of interest to Civil War buffs, students, and teachers of American history, this volume will also serve as a handy aid for speechwriters and public speakers.